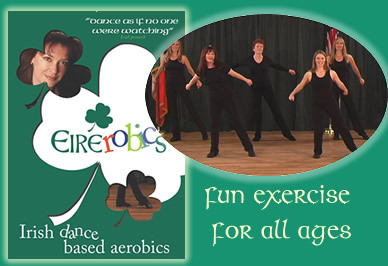 Eirerobics is an easy to follow Irish Dance Exercise Program - a Dance Exercise Video / DVD featuring wonderful Traditional Irish Music. Beat stress! ~ Lift your spirits! Get fit the Irish way! Exercise DVD features a simple Irish jig and reel steps, combined with classic aerobic exercise moves. Eirerobics is an easy, fun workout for all ages and fitness levels. Inspired by both Irish step dancing and traditional ceili (Irish group dancing) dance steps, Eirerobics provides a great cardio workout, while making you feel like an Irish dancer. Take a look at our Dance Exercise Video and Irish Music samples. They are available on the subsequent pages. to read what others are saying about us!